>> How To Travel or Live Abroad With Kids When Your Ex Says NO! So you want to travel or live abroad with your kids and expose them to other cultures but your ex is saying “NO WAY”. What do you do? Here is my personal story of how I was able to get permission to travel and then to live abroad with my kids despite my ex-husband (the father of my 2 sons) FIGHTING ME TOOTH AND NAIL. It wasn’t easy but it can be done. “Yes Officer, I DO have permission to travel with my children”. If you have kids and want to travel internationally without the other parent, you are supposed to have written permission from the other parent. Without written permission, you run the risk of getting denied entry into that other country. But what happens when the other parent refuses to write you a letter giving you permission? Even between the US and Canada. In 2010, I flew into Montreal like I’ve done so many times before with two minor differences. I only had 2 of my 3 children with me and my husband Blake was not with me. Blake and my eldest son were driving a moving truck across the country towards some tiny storage unit in Massachusetts. I exited the plane with my son and daughter and promptly walked to the immigration and customs area to wait in line to get our passports stamped. When it was our turn, I handed the customs agent our passports. He immediately took them and furrowed his eyebrows as if he were straining to read our names. No Big deal, I expected this scrutiny since I was ONE ADULT flying with kids and no father in sight. To make matters worse, in addition to me flying alone with my children, it’s not immediately apparent that I am the children’s mother because we have three different last names. If you haven’t guessed yet, I have a blended family and we have 3 different last names. FIRST NAME: My name is Annie Andre. Andre is my maiden name that I’ve kept on all my documents. SECOND NAME: I’ve remarried and my daughter and my husband have the same last name. THIRD NAME: My two sons are from a previous marriage over a decade ago and they have my ex-husbands last name. It doesn’t help that one of my son’s first name is my last name or that my other son has my last name as his middle name. ( “ANDRE”). I digress! I’m used to carrying documents showing that I have permission to travel with my sons. 95% of the time, I am never asked for proof that I have permission to take my boys out of the country but today was one of those rare occasions. However the passport agent only asked me to show my “permission slip” to travel with my daughter and NOT my son. Okaaaaay? My daughters birth certificate which showed Blake and I were her parents. A photocopy of Blake’s Passport for good measure. Hypothetically speaking, had the passport agent asked me for proof that I had permission to travel with my son, I would have handed him a COURT ORDER which allows me to travel freely with my two boys. You’ll notice, I did not have a written letter of consent from my ex husband. I had a court order. I’ll explain why and how I got this court order in a moment. “Welcome Back to Canada” said the smiling customs agent. Then the border police stamped our passport and off we went to my family’s house in Montreal. A few years ago, Blake and I decided to elope to Europe. We had originally said we were not going to get married but after the birth of our daughter, it just made sense. We wanted to take all three of the kids with us so we could have a month long family honey-moon. I thought my EX (the biological father of my two sons) would agree to let me take the boys with us to Europe. After all, it was only a month and it was for my wedding. Easy right? Nothing is every easy with a vengeful ex. No amount of pleading, begging or bribing could persuade my ex into writing a letter to give me permission to travel with the boys. Rather than just rolling over and leaving the boys behind, I took my ex to court and big surprise “I won”. (That’s just the way I roll). It was rather silly.I suppose the judge could see that my ex was trying to be difficult because he ordered my ex to sign all the documents so that I could travel abroad with the kids without his written permission. The judge also granted me permission to get passports for my boys without the need of my ex husbands signature. (You normally need two parents signature to apply for a minors passport). The judge also gave me permission to travel anywhere in the US and Canada and internationally without written permission from my ex as long as I tell him our itinerary. It was this COURT ORDER I used on the day I went to Montreal with my kids and it’s what I carry with me when I travel anywhere for short visits like vacations. But what if I want to spend more time abroad? What if I want to live abroad or spend up to a year abroad travelling with my kids? In case you were wondering, we spent 3 1/2 weeks in Paris and then flew to Edinburgh Scotland to have a small civil ceremony on July 14th which happens to be Bastille day (French independence day). You can read about why we decided to elope to to Scotland as a family rather than get married locally. You can also get the inside scoop on we to we eloped to Scotland too. CHEEEEEEEEEEEZE. I’m so glad we took the boys with us. It just would not have been the same without them. 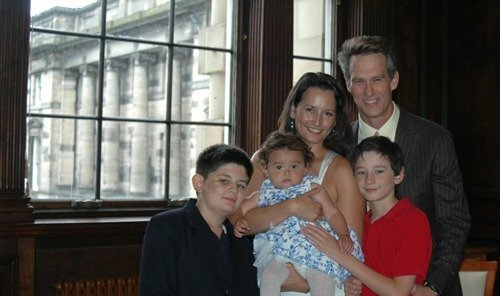 Blake and I after the civil ceremony in Edinburgh. One of my sons is the photographer. The kids hanging out at Edinburgh Castle. 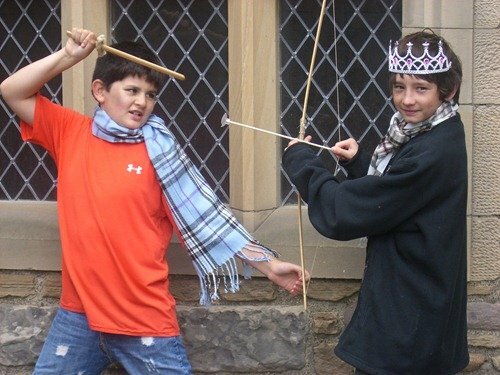 The boys re-enacting the battle of Langside where Mary Queen of Scotts was defeated. I had permission to travel and visit other countries with the boys but not permission to LIVE abroad. Right now, as I write these words, I am living in France with my husband Blake and 3 children. The COURT ORDER that I obtained for travelling with my boys ( which I mentioned above) was not valid for “LIVING” in another country. I could only stay in Europe as a tourist with my family for 90 days but I wanted to live there for a year legally and immerse the kids in French culture and send them to school in France. For that I needed a special visa called the “LONG STAY VISA” which gave us the right to send our kids to school and stay legally in the country for one year not 90 days. The problem was that my court order stated I could travel to France, not live in France. Travel and Live are two different concepts and the French Embassy required that I either get written permission from my ex that clearly stated I could “LIVE” in France with my two sons or a court order showing that I can “LIVE” in France. I called up my ex and explained to him what I wanted to do. 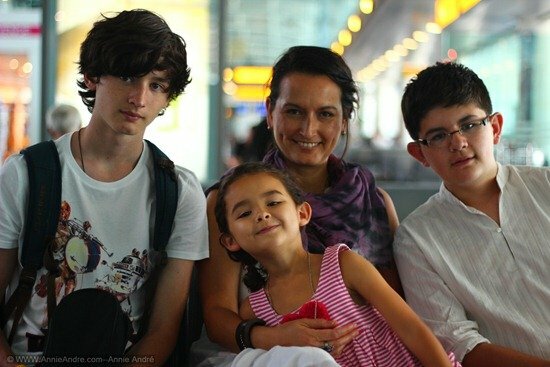 Parents send their kids abroad for a year of study all the time. 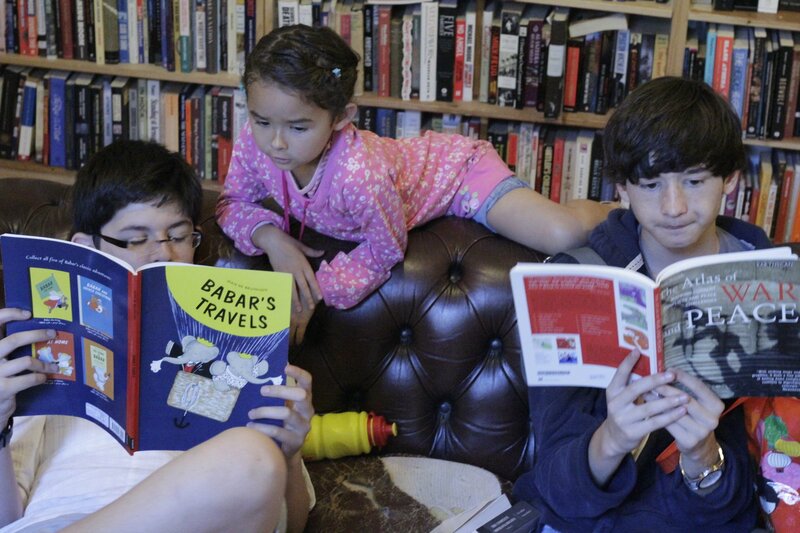 I wanted my children to experience a year abroad but I wanted to be there with them. I hoped that my ex would be okay with the kids spending a year abroad. He was but not with the idea of me being there with them. Again, no amount of pleading, begging, no agreement I came up with was good enough for him and he would not write me a letter giving me and the boys permission to live abroad. So again I petitioned the court to intervene and decide. SIDEBAR: Now before you jump on my back about taking the boys away from their birth father let me first say that my situation may be very different from yours. 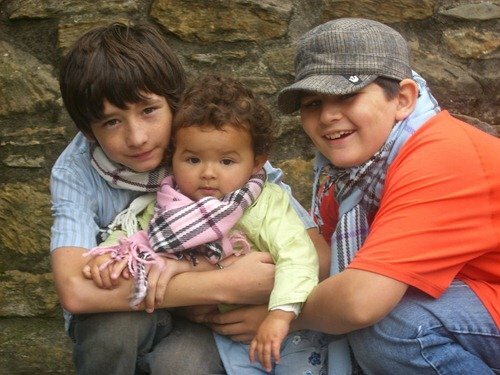 Obviously since I am writing this while living in France, the judge granted me permission to LIVE in France with my boys. Just because you take your ex to court does not guarantee you will win. In my case my ex did not have a very good track record as a parent. There were a lot of variables that worked in our favour. The bad economy and the fact that my husband and I could not find jobs in our field. The educational opportunity for the boys and the fact that we would and could be home for the kids after school. But there was one big variable which may shock many of my friends who knew me and my ex because I have not told anyone but family and close friends about because of fear of retaliation from my EX. In my opinion, my ex’s LACK of involvement and lack of assistance weighed heavily on the judge’s ruling to allow us to travel. Rarely Saw the boys: My ex rarely saw the boys. On two separate occasions I had to pay him and his sister to baby-sit for me. ( I finally found a sitter so I could have a break once a month). Endangerment: On one occasion my ex was supposed to take one of my sons for 30 days in the summer but I was called by his then girlfriend after 15 days to come and pick my son up because my ex was too drunk to take care of him. Lack of Support:My ex went 8 years without paying me a dime of child support while receiving wages from working under the table before the courts finally took action and required proof that he was looking for a job. A real job. Now his pay-checks are automatically deducted and I get child support but he will be in his sixties before he ever catches up on all of his back child support that is owed to me and the boys. The boys will be close to 30 at that time. I could go on, but you get the picture right? I am sharing all of this with you because I actually don’t think it is always a good idea to move out of the country with your children if the other parent does not want them to. For instance, had my ex been involved in my boys lives then I would not have attempted to take them out of the country. But since he was barely there for them there was really no loss in my eyes. And the judge thought so too. I’ll briefly explain the court process that I went through. At the time, I was living in Montreal and my ex was in California. I called up the lawyer I used before and asked her to file a new petition to allow me to take the kids abroad. I did not even have to fly to California. I was on the phone for the entire court proceeding. I could hear my ex presenting his case. My lawyer was present in California on my behalf. It lasted 20 minutes at most and then the judge made his ruling and I was allowed to LIVE in France for not one but TWO years with the boys. So How Do You Get YOUR Court Order? Before you go and try to get a court order to travel with your kids, I strongly advise you to speak with your ex first and try to draw up an agreement. It’s not only the best way to do it, it will also cost you less money leaving you with more money for your family. But if your ex does not want to give you permission and you have your heart set on travelling or spending a year abroad like us then you’ll have to go to court. DO IT YOURSELF OR HIRE A LAWYER? I hired a family law lawyer. Each time I used my lawyer it cost between 1,500 and 2,000 dollars. The lawyer I used was in the Santa Clara County of California since that is where I lived with my kids and that is where our custody agreement is. I did nothing else but search on the Internet for a family law lawyer who handled child custody and modification agreements. Then i just called them and found the one I liked. ( I called 3). I talked with several parents who did NOT hire a lawyer. They filled out and filed their own documents and you can do this too. Go to your local family court-house and ask if they have free legal advice service or people on hand who can help you choose the correct documents and help you fill out the paperwork. Once your documents are filled out, you file them and wait for your court date. In addition to filing my court docs, I wrote a very wordy document about why I wanted to take the boys and why it benefited them. I wrote a bit about how much or little my ex was involved in my boy’s life. There is no format for this. I just winged it and wrote from the heart. WHAT DOCUMENTS DO YOU NEED TO TRAVEL OR LIVE ABROAD WITH KIDS? Just to summarize here are the documents you should travel with. I spoke with several parents who travel internationally or live abroad with kids (alone). Some people I spoke with don’t even get permission from their ex. They just chance it. Others didn’t even know that they were supposed to have written permission. So technically you could always chance it and go without written permission. Personally, I wouldn’t chance it..
You never know when you will be asked to produce documentation. So here is what I recommend you travel with.. Always travel with a letter from the other parent. It should give you permission to travel with the kids and it should be dated and signed. Many government sites say that the letter should be notarized but so far I have only used NON notarized documents. I Also bring a copy of my child’s birth certificate which shows who the parents are. I have a friend (Talon, a single dad )who adopted his son and on the birth certificate it only shows him as the father the mother area is left blank so he doesn’t need to show any other documentation. Although he did say that he travels with the adoption papers just in case but that no one has even asked him to show any proof of the mothers permission. A copy of your spouse or the other parents ID. Preferably a passport if you can manage. I have a copy of my husbands but not my ex. Here is a link to the Canadian site with a link to a blank letter for you to fill out. Here is the link to the U.S. site stating the requirements. If you can’t get a letter of approval than you will have to get a court order like i did. Be very careful of the wording you use in the court order. Will you travel with the kids on vacations? Will you live abroad for a year? What countries? Will you travel nomadically during a period of time? For how long? What about the kids education? Health Insurance? How will they communicate with the other parent while abroad? These are all things I had to consider and answer and you may need to do the same for your court order. ps: I wanted to add one thing. Not many people know this story including my friends. I think a lot of them will be very shocked to find out about this private matter. I was going to keep it private but I think and I hope in the least that my transparency and my struggles will inspire and empower other single parents and blended families not to fear un-cooperative ex spouses. I always advocate amicable relationships with ex’s but that’s just not always possible is it? You have to do what is best for the kids and that is what I did. I realize there may be some of you who disagree with the idea of travelling and living abroad with kids. You are entitled to that opinion. I lived abroad and travelled a lot as a child and I am so grateful my parents gave me that opportunity. So much so that I want to give my kids the same gift that I received. My kids are experiencing other cultures and seeing the way other people live first hand not to mention the fact that they are fluent in French now. These are all things they would normally do and see in a classroom or some textbook but are getting to experience first hand. Plus they are learning to be more creative which makes for better problem solvers who can adapt better to change in this world. It took a lot of sacrifice on my part and my husband’s part to take the kids abroad but it’s totally worth it. I would love to know your thoughts? Leave your comments below.